466 pages | 92 B/W Illus. Forensic metrology is the application of scientific measurement to the investigation and prosecution of crime. Forensic measurements are relied upon to determine breath and blood alcohol and drug concentrations, weigh seized drugs, perform accident reconstruction, and for many other applications. Forensic metrology provides a basic framework for the performance and critical evaluation of all forensic measurements. It enables forensic scientists to better develop, perform and communicate forensic measurements; lawyers to better understand, present and cross-examine the results of forensic measurements; and judges to better subject testimony and evidence based on forensic measurements to the appropriate gatekeeping analysis. The book begins by introducing and developing metrological principles and concepts. Next, it presents advanced and mathematically rigorous principles and methods of inference in metrology. 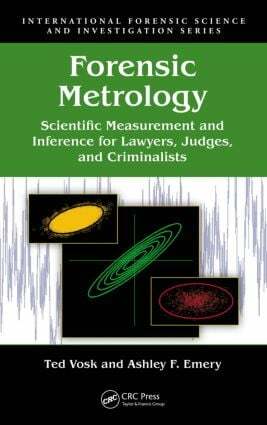 Throughout the book, scientific and legal aspects of measurements are addressed and accompanied by examples. The accompanying CD includes an in-depth Primer on Forensic Metrology and provides practice materials for legal and forensic professionals that include court decisions, legal motions, and expert reports. A basic understanding of forensic metrology will improve the practices of both legal and forensic professionals, helping to ensure the integrity of the legal system, its fact-finding functions, and the practice of justice in the courtroom. Ted Vosk is a criminal defense attorney and legal/forensic consultant. Over the past decade, he has been a driving force behind the reform of forensic practices in Washington State and the laws governing the use of the evidence they produce. His work in and out of the courtroom continues to help shape law in jurisdictions around the country. He has been awarded the President’s Award from the Washington Association of Criminal Defense Lawyers and the Certificate of Distinction from the Washington Foundation for Criminal Justice. A Fellow of the American Academy of Forensic Sciences and member of Mensa, he has written, broadcast, presented, and taught around the country on topics ranging from the origins of the universe to the doctrine of constitutional separation of powers. He has been published in legal and scientific media, including the Journal of Forensic Sciences, and his work has been cited in others, including Law Reviews and treatises. Ashley F. Emery is a professor of mechanical engineering at the University of Washington and an adjunct professor of architecture and of industrial and systems energy. He has been an associate dean of the College of Engineering, chair of the Department of Mechanical Engineering, and director for the Thermal Transport Program of the National Science Foundation. His areas of research interest are heat transfer, fluid dynamics, architectural and building energy, thermal stresses, fracture, design and interpretation of experiments, and Bayesian inference. He has published more than 200 technical papers in refereed journals. He is a fellow of the American Society of Mechanical Engineers and the American Society of Heating, Refrigerating and Air-Conditioning Engineers. He is a recipient of the American Society of Mechanical Engineers Heat Transfer Memorial Award and the 75th Anniversary Heat Transfer Award.